On November 10, 1995, a Signing Ceremony took place between the State Oil Company of Azerbaijan (SOCAR) and a consortium of four international companies for the Karabakh structure offshore Azerbaijan in the Caspian. The contract is for exploration, development and production sharing agreement. 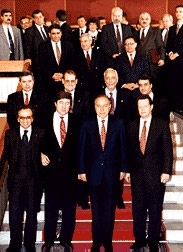 Parliament ratified the agreement on February 14th, 1996. Photo: First row: (L-R) Italian Industry Minister, Alberto Clo; Russian Energy Minister, Shafranik; Azerbaijan's President, Heydar Aliyev; US Deputy Energy Secretary, Charles Curtis. Second row: Company Presidents: LUKoil, Vahid Alakbarov; Pennzoil, Tom Hamilton; Agip, Guglielmo Moscato; SOCAR, Natiq Aliyev. Third row: Azerbaijani Government Leaders: Prime Minister Fuad Guliyev, Parliament Speaker Rasul Guliyev, Foreign Minister Hasan Hasanov. Members of the Karabakh Consortium include Pennzoil with a 30% share; LUKoil of Russia (7.5%); Agip of Italy (5%), and LUKAgip, a subsidiary of LUKoil and Agip (50%). In addition, a commercial affiliate of SOCAR has a 7.5 % share. Investments totaling 1.7 Billion have been planned for production start-up and operating costs are estimated at 1.3 Billion. This is the second major international Consortium Contract that SOCAR has signed for projects in the Caspian. The first took place in September 1994 with a consortium of 11 foreign companies for the Azeri, Chirag, and deep-water Gunashli fields under direction of AIOC (Azerbaijan International Operating Company). Both Pennzoil and LUKoil are also partners in the AIOC Contract. Presidents of the respective companies were in Baku for the signing: Guglielmo Moscato (Agip), Oleg Vasiliyev (LUKAgip), Vahid Alakbarov (LUKoil), Tom Hamilton (Pennzoil) and Natiq Aliyev (SOCAR). Also participating were Azerbaijan's President, Heydar Aliyev; the Italian Minister for Industry, Alberto Clo; the Russian Minister of Energy, Shafranik; and the US Deputy Secretary of Energy, Charles Curtis. The Karabakh Block is located approximately 15 km NE of the Chirag, Azeri, Gunashli block. Water depths vary from 170-200 meters and the main target is located at a depth of 3,340 to 3,640 meters below sea level. The field has estimated reserves of approximately 620 million barrels of recoverable oil. The work commitment includes a seismic program and exploratory drilling for three years, which may be extended an additional 1.5 years if further work is needed. The agreement will have a development and production period of 25 years which may be extended an additional five years. The key to the development of the project's effectiveness lies in integrating Western technology with existing infrastructures. The facilities in the area have a great deal of potential but have become obsolete as no investments have been made and maintenance has not been carried out. Another difficulty involves transfer of the production from the field to the coast of Azerbaijan, and from there to international markets. Agip's President, Guglielmo Moscato noted, "Projects such as the Karabakh prove once again that culture and traditions which are extremely diverse can still combine and generate a special type of enthusiasm in projects of entrepreneurial and cooperative nature."